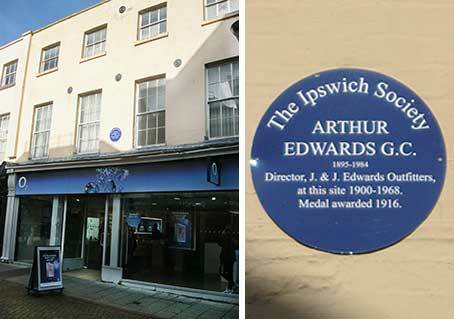 The Ipswich Society (see Links) has installed a number of blue plaques in the town: their version of the English Heritage blue plaques seen in London. (By late 2012, with a recession biting, E.H. announced that they would no longer be researching, mounting and maintaining the London plaques, due to cuts in funding – this seems to have changed again by 2014.) What started at the turn of the century continues to be an important and relevant tribute to some of the most distinguished people who were born in the town or subsequently lived there. Their hope is that the plaques will make the streetscape and our history more interesting. Arthur Frederick Edwards, GC (1895-1984) was awarded the George Cross in 1971 having received the Edward Medal in 1919 (now in the Ipswich Museum). The award was for bravely assisting, with three other soldiers, in the rescue of wounded at Faversham Powder Mills store, Kent, when serving as a Bombardier in the Royal Artillery in April 1916. The store which contained 200 tons of TNT was afflicted by a chain of explosions which Edwards and his colleagues prevented while saving many wounded and inspiring others to assist. Arthur was educated at Ipswich Grammar School and Bishop’s Stortford School. He became a director of the department store, J&J Edwards, which was based at 33-35 Tavern Street from 1900-68. 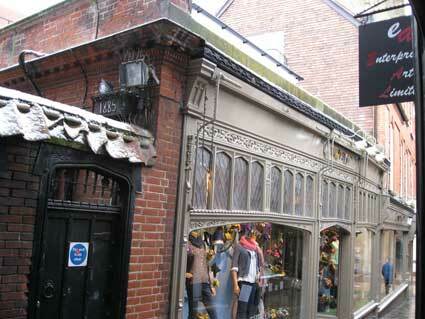 The retailer was founded by Arthur Edwards’ father, James F Edwards, and his uncle. The plaque was unveiled in November 2018. 3 St Edmunds Road, Ipswich. 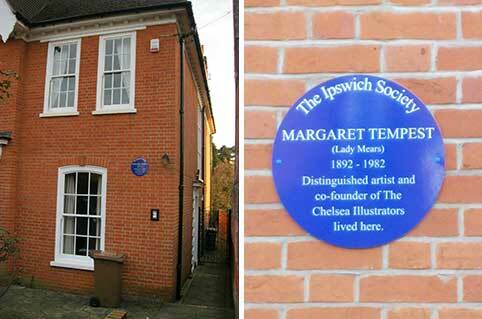 Margaret Tempest was born at 28 Fonnereau Rd Ipswich, later moving to 34 Park Rd. She attended Ipswich Art School and Westminster School of Art, graduating in 1914. She was a founder member of the Chelsea Illustrators: a society of twenty women illustrators, who successfully worked together between 1919 and 1939. Margaret is credited with the distinctive design of Alison Utley’s Little Grey Rabbit books, which she illustrated from 1929 into the 1960s. She illustrated her own books as well as those of a wide range of authors. From London, Margaret returned to Suffolk many weekends to pursue her passion of sailing. In 1939 Margaret moved permanently to the Ipswich area and married Sir Grimwood Mears. They moved to 3 St Edmunds Rd in January 1951, where Lady Mears continued living until her death. A long-time member and committee member of Ipswich Art club, she exhibited her artwork till the age of 82. While we're in this road, let's note one of the few street nameplates in Ipswich to use the possessive apostrophe in: "ST. EDMUND'S ROAD" (which isn't to be found in the more recent 'St. Edmunds Place' – but both include the unnecessary full stop after 'St'). Unicorn House Foundation Street, Ipswich. 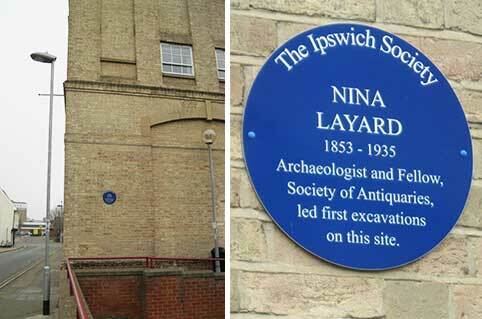 Nina Layard was an archaeologist and writer. She is credited with the first excavations of the old Dominican Friary in Blackfriars, Foundation Street in 1898. Her work on the Valley Brick field in Foxhall Road, has been acknowledged as highly significant, and her paper on the Hadleigh Road Anglo-Saxon site was presented to the Society of Antiquarians in London, where she was one of the first women to become a Fellow. 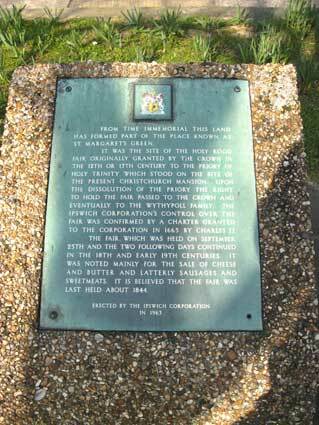 Following a newspaper appeal by her, public subscriptions were raised for the memorial to nine Ipswich Martyrs (now) in Christchurch Park (1903). 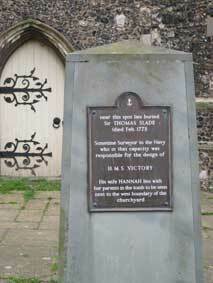 She also published Seventeen Suffolk Martyrs and other local history books. She was a founder member and first woman president of the Prehistoric Society of East Anglia. Arlington’s Restaurant Museum Street, Ipswich. 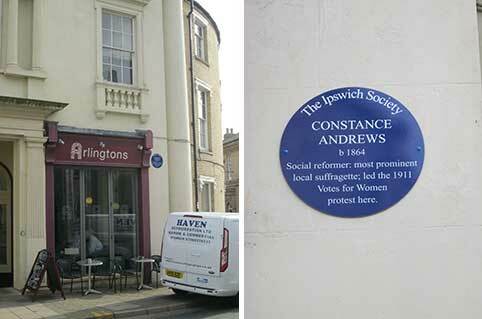 Constance Andrews was a leading Ipswich suffragette, was committed to social justice and the campaign for Votes for Women. She formed the local branch of the campaigning group The Women’s Freedom League. This inspired a group of women who demonstrated, held meetings, organised propaganda events, and carried out acts of civil disobedience – all to gain support and put pressure on the government to give women the vote on equal terms with men. In 1911 she organised the ‘No Vote, No Census’ protest in Ipswich, when about thirty women spent the night in the Old Museum Rooms to boycott the Census. Later she spent a week in Ipswich prison after refusing to buy a dog licence – part of a No Vote, No Tax campaign. She was met at the prison gates by a large crowd of supporters, and processed in a carriage through the streets to a celebration breakfast at 16 Arcade Street. 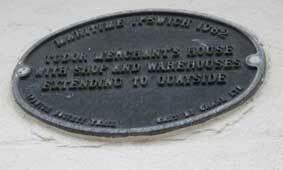 A smaller-that-usual sized plaque on the eastern pilaster of the Town Hall frontage. 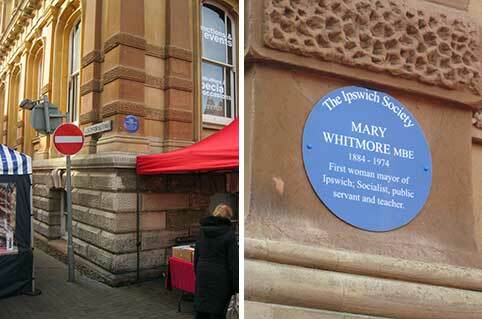 Mary Whitmore was the first woman mayor of Ipswich. Her interest in politics began when she joined the suffragette movement at the formation of the Ipswich branch of the Women’s Social and Political Union, (WSPU). After joining the Labour party in 1924 she was elected as a councillor in 1930 and was very active in, and chaired a number of public health committees. One of the founder members of the local Workers Education Association (WEA), she was secretary from 1929-39. A pioneer of women’s suffrage, education and public services she was described by Doris Young, (a member of the National Labour Women’s Advisory Committee), as a socialist, pacifist, and internationalist. Whitmore was Mayor in 1949-50 and was awarded the MBE in 1951 for her contribution to public services. 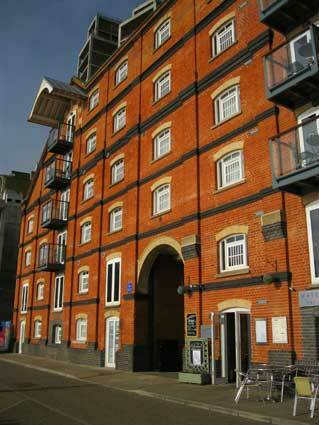 This is the red brick Paul's maltings on Albion Wharf, probably the most handsome of the Wet Dock buildings. (Because Paul's Maltings owned so many structures around the dock, developers/planners seem to have favoured calling this building "Cambria".) 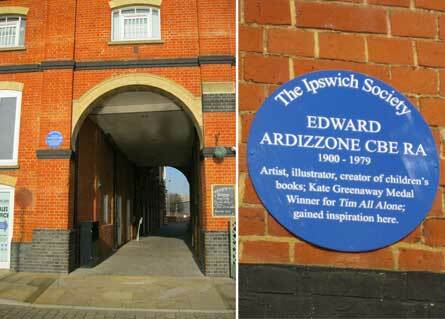 Ardizzone had strong links with Ipswich. A (not entirely happy) pupil of Ipswich School in the early 1900s, he often wandered around the Wet Dock for inspiration, eventually becoming a noted artist, book illustrator and author. His capturing on paper of local characters in the streets and in the many local pubs showed his characteristic loose line-work. Unveiled in June 2014, this celebrates one of the biggest international traders in postage stamps from his premises on both sides of Lacey Street. For much more on this, see our Morpeth House page. The Great White Horse, Tavern Street. The English writer and social critic created some of the world's most memorable fictional characters and is generally regarded as the greatest novelist of the Victorian period. During his life, his works enjoyed unprecedented fame, and by the 20th century his literary genius was broadly acknowledged by critics and scholars. His novels and short stories continue to be widely popular. 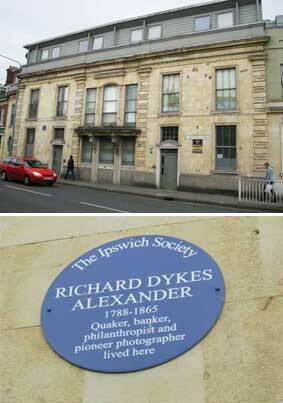 In 1835, Charles Dickens stayed in Ipswich and used it as a setting for scenes in his novel The Pickwick Papers. The hotel where he resided first opened in 1518; it was then known as The Tavern and later became known as the Great White Horse Hotel. Dickens made the hotel famous in chapter XXII of The Pickwick Papers, vividly describing the hotel's meandering corridors and stairs. Manor House, St Margaret's Green. This address was the house occupied by the Cobbold family when their celebrated servant Margaret Catchpole stole their prize horse to ride to the rescue of her lover in London; she was imprisoned in Ipswich Gaol, escaped, was recaptured, sentenced to death and eventually transported to Australia. 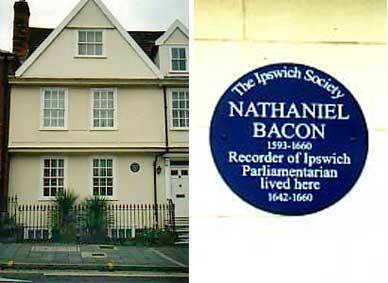 Nathaniel Bacon, described as a "pious, prudent learned man", was a member of the Bacon family which achieved great prominence nationally under Elizabeth I. Nathaniel was a key figure in Ipswich political life in the mid-17th century. He became its leading lawyer – the Recorder; its MP from 1646 to 1660; and its historian, being the compiler, in 1654, of The Annalls of Ipswiche, The Lawes Customes and Government of the Same. During the Civil War he was Chairman of the Eastern Association Committee and a strong supporter of the Puritan cause. This made him very important regionally and nationally as an administrator and organiser during the War and the period of Commonwealth government, although he was opposed to the execution of Charles I and to the proclamation of the Commonwealth. The great Suffolk artist Gainsborough was born and educated in Sudbury, where he has long been properly honoured with a statue on the Market Hill. 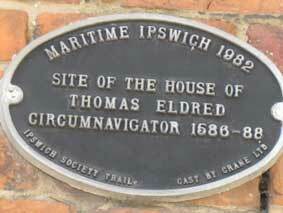 It is less well known that he spent seven formative years in Ipswich, 1752-1759. After a few years of apprenticeship in London, he had returned to Sudbury in 1748 but he moved to Ipswich in 1752 because commissions for portraits were more easily obtained here. 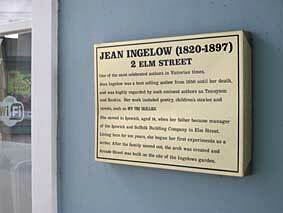 He rented 34 Foundation Street, a house similar to No 32 where the plaque is mounted. No 34 was shamefully demolished in the early 1960s. As well as painting portraits and landscapes in Ipswich, Gainsborough was an enthusiastic member of the Ipswich Music Club. He played several keyboard and stringed instruments. He moved to Bath in 1759; the fashionable spa gave him more opportunities for meeting and painting rich patrons. But it is appropriate that Christchurch Mansion in Ipswich houses one of the best collections of Gainsborough's paintings outside London, and that it includes one of his finest works, the portrait of William Wollaston, MP for Ipswich, playing the flute. 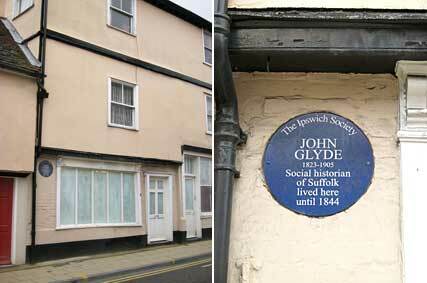 John Glyde is recognised as the foremost 19th century historian of Ipswich and Suffolk, the author of books which are still standard reference works on the social and economic aspects of the town and county. A radical thinker, he was involved in many organisations working for the social and cultural improvements of Ipswich, including the founding of a Free Library for the town (see our Rosehill case study page for more on the story of Ipswich libraries). 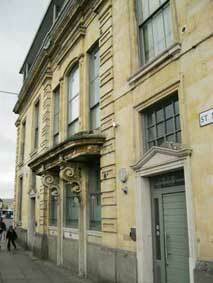 His bequest of books and manuscripts to the Ipswich Corporation in 1905 is now in the Suffolk Record Office, Ipswich. During his working life he was a bookseller, an agent for domestic servants and a registrar of marriages. One of the most celebrated authors in Victorian times, Jean Ingelow's fame declined to almost nothing during the 20th century, although there is still a Jean Ingelow Society in America. However, she was one of the best selling authors from 1850 until her death and was highly regarded by such eminent authors as Tennyson and Ruskin. Her work included poetry (the best known of which was A High Tide on the Coast of Lincolnshire, still widely anthologised in the mid-20th century), children's stories and novels, such as Off the Skelligs (most of which is still very readable). Born in Lincolnshire, at the age of 14 she moved to Ipswich when her father became manager of the Ipswich and Suffolk Banking Company in Elm Street. Living here for ten years in the spacious first floor rooms over the bank she began her first experiments as a writer. After the bank failed and the family moved out, the arch was created and Arcade Street was built on the site of the Ingelows' garden. "The Master's House", 19 Lower Brook Street. King was born at 19/21 Lower Brook Street where his father, The Rev John King, was Master of Ipswich (Grammar) School in that building. 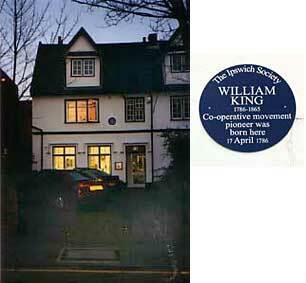 William King became a physician, working in Brighton, but he is celebrated as a founder of co-operative democracy. He created a Co-operative Benefit Fund and a Co-operative Trading Association. He also founded and wrote the periodical The Co-operator (1828-1830) which helped to inspire the "Rochdale pioneers" of the Co-operative Movement later in 1844. It seems fitting that in Ipswich, where Co-operative retailing had – until the closure of of almost all of the town centre store in 2010 – held its own remarkably well, we should acknowledge this pioneer of the social and philosophical principles of Co-operation, even though this work was done after he left Ipswich. The building on which this plaque is displayed was originally known as The Preacher's House; the change of name came when it became occupied by the Master of The Ipswich Grammar School, forerunner of The Ipswich School on Henley Road. William King was the son of one of the Masters, Rev. John King. At the time there was a high wall in front of the house with a large yard/garden/playground (about 30 by 80 feet) at the rear stretching back to a rear gate opening onto Foundation Street, opposite the rest of the school in part of the remaining Blackfriars buildings (in the first floor fomer friars' dormitory, the refectory schoolroom having been demolished in 1766), also Christ's Hospital School and the Shire Hall. Dancing classes were held on the upper floor of the Master's House. See the Christ's Hospital School page for a sketch map of the area. The plaque simply calls V S Pritchett a "writer" because he excelled in so many genres of writing that there wasn't room to specify! He is regarded as arguably the finest English short story writer of his time. He also published novels, travel books, literary criticism, reviews and an absorbing autobiography, A Cab at the Door, in which he explained how his father, a London businessman in financial difficulties, lodged with his wife over a toyshop at 41 St Nicholas Street. Here baby Victor was born a century ago on 16 December 1900. 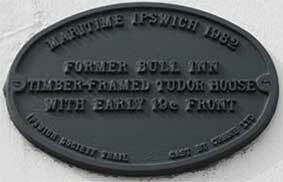 The family returned to Ipswich in 1910, living for a year in the Cauldwell Hall Road area. Pritchett was knighted in 1975 and was made Companion of Honour in 1993. He died in 1997. 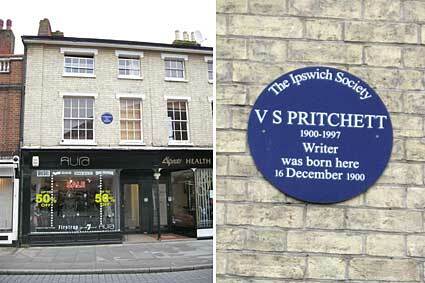 The plaque records him as "V S Pritchett", rather than "Sir Victor Pritchett, CH", because that is how he signed himself as a writer and is known to all his readers. 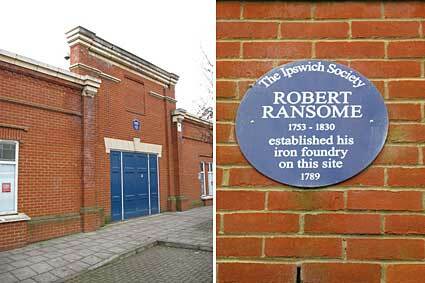 For the best part of two centuries, Ransome's was probably the most famous Ipswich name around the world — certainly as far as manufacturing was concerned. Robert Ransome came to Ipswich from Norwich in 1789 to set up an iron foundry, first briefly near St Mary at Quay and then soon after in that year at St Margaret's Ditches, now Old Foundry Road, where the street name still commemorates the site. The works, in time, stretched from Great Colman Street to Carr Street. Still under family control after Robert's death, the foundry closed on this site in 1849, moving to the dockside, and the firm eventually became Ransomes Sims and Jefferies, making agricultural machinery, lawnmowers, etc. Later another company, Ransomes and Rapier, was created making heavy engineering products such as dragline cranes, railway equipment and large sluice gates for dams. Robert Ransome was one of a group of highly influential Quakers in the town. He set up a fund for employees unable to work through sickness or injury. 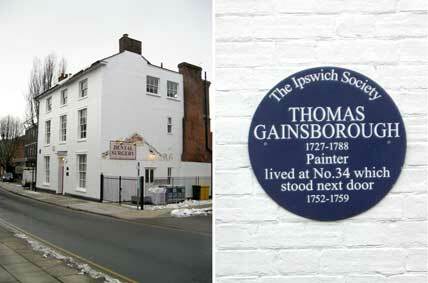 He was also instrumental in bringing gas lighting to Ipswich, installing a gasmaking plant in part of his foundry. H.J. Leslie Barefoot G.C. 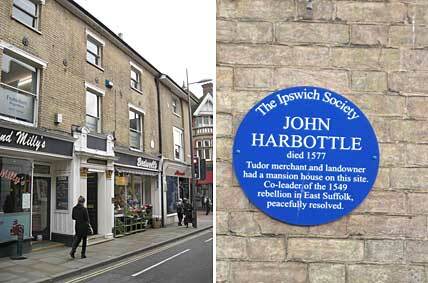 was the architect of the small central pedestrian shopping streets in the centre of Ipswich known as Thoroughfare (the older of the two) and The Walk, the latter of which is the site of his plaque. Born in Dulwich he married in 1913 and served in The Great War with distinction. In 1920 he moved to Ipswich with his family and during the inter-war period designed buildings throughout East Anglia, becoming president of the Suffolk Association of Architects. Re-joining the army in 1939 in the Royal Engineers he volunteered to form a new unit to deal with unexploded bombs. The George Cross database indicates: "During the early days of the blitz Major Barefoot, who was a pioneer in bomb disposal dealt with some of the first unexploded bombs which fell on Britain. He was able to put invaluable information at the disposal of the authorities." His citation in 1941 for the George Cross states: "for most conspicuous gallantry in carrying out hazardous work in a very brave manner." He was the first Army officer to receive the GC. 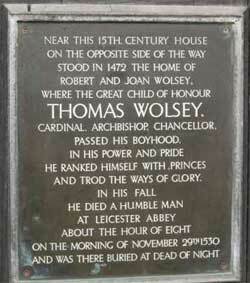 He is also commemorated by a plaque in Westminster Abbey together with the other recipients of the George Cross. 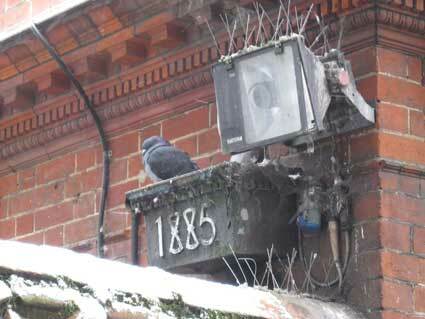 Below: it is worth including here a dated '1885' rainhopper (51 years before The Walk was built) – complete with roosting pigeon – spotted in the lower section. This is at the rear of the shop fronting Butter Market which was for many years the Noble Romans pizza resturant, but more recently a clothiers. The splendid neo-medieval carving and fenestration by Henry Munro Cautley, which characterises The Walk, can also be seen. Such dated rainhoppers are gathered together on their own page. The builder of these pedestrian ways was V. A Marriott. See our page on Public clocks in Ipswich for a 2018 view of the Tavern Street entrance and its clock. During refurbishment of The Walk in the 21st century, this blue plaque was resited to a lower position, perhaps making it more noticeable and readable. 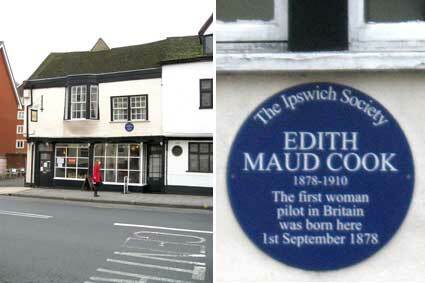 Edith Maud Cook was born at 90 Fore Street on 1st September. She was a balloonist, a parachutist and is stated, on the RAF Museum website to have been the first woman pilot in the United Kingdom. Edith made around three hundred balloon ascents and demonstrated the use of parachutes over a period of ten years. After she learned to fly in early 1910 she made several solo flights but did not obtain a pilot's licence before July of that year. On 11th July 1910 as reported in The Times: "Miss Viola Spencer (a pseudonym) in a parachute descent at Coventry on Saturday, alighted on a factory roof. The parachute turned over and Miss Spencer fell onto the roadway injuring herself severely." She died on 14th July as a result of her injuries. In her book Before Amelia Eileen Lebow tells the remarkable story of the world's women pioneer aviators who braved the skies during the early days of flight. At a time when the mere sight of ladies wearing trousers caused a sensation Edith Maud Cook was one she praises as an adventurer and a very courageous woman. Alexander House, 73 St Matthews Street. The son of Dykes Alexander (1763-1849) was a noted Quaker banker, photographer and philanthopist of the town. Richard built his house on the corner of St Matthews Street and Portman Road; long empty, this distinguished building was in 2009 extended and refurbished as flats. Although it has a 'bank-like' facade, suggesting a previous use (the Alexander Bank on Bank Road was well known from the 18th century – see Street name derivations), the structure was built as the Alexanders' home in the fields to the west of the town c.1840 and must have included a considerable parcel of land. When Richard Dykes Alexander made much of this land available for housing in the 1850s he stipulated that some of the street names should be those of leading slavery abolitionists. Kett's Rebellion was a revolt in Norfolk during the reign of Edward VI (1537-1553), largely in response to the enclosure of land. It began at Wymondham on 8 July 1549 with a group of rebels destroying fences that had been put up by wealthy landowners. One of their targets was yeoman farmer Robert Kett who, instead of resisting the rebels, agreed to their demands and offered to lead them. Kett and his forces, joined by recruits from Norwich and the surrounding countryside and numbering some 16,000, set up camp on Mousehold Heath to the north-east of the city on 12 July. The rebels stormed Norwich on 29 July and took the city. But on 1 August the rebels were defeated by an army led by the Marquess of Northampton who had been sent by the government to suppress the uprising. Kett's rebellion ended on 27 August when the rebels were defeated by an army under the leadership of the Earl of Warwick at the Battle of Dussindale. Kett was captured, held in the Tower of London, tried for treason, and hanged from the walls of Norwich Castle on 7 December 1549. Leonard Squirrell was born in Ipswich. He studied art at Ipswich School of Art 1908-1916 under George Robert Rushton, then at the Slade School of Fine Art in 1921 under Henry Tonks. Exhibited at the Royal Academy, RWS, RI and RSA. Squirrell won a number of medals for his etchings, a technique of which he was a master. His work is held in many public and private collections, including the Victoria & Albert Museum, British Museum and Fitzwilliam Museum in Cambridge. His most famous painting is a view of the Wet Dock drawn from a vantage point atop the gasometer. It is difficult to over emphasise the importance of Squirrell as a documenter of ipswich, Suffolk and the wider world. His drawing style might be considered by some 'old fashioned', meaning showing great draughmanship and accuracy while delivering a visually pleasing, excellent result. His colour work is the match of his beautiful pen and ink drawings. The English neurophysiologist, histologist, bacteriologist, and a pathologist, Nobel laureate and, in the early 1920s, president of the Royal Society was educated at The Ipswich School. He received the Nobel Prize in Physiology or Medicine with Edgar Adrian, 1st Baron Adrian in 1932 for their work on the functions of neurons. Prior to the work of Sherrington and Adrian, it was widely accepted that reflexes occurred as isolated activity within a reflex arc. Sherrington received the prize for showing that reflexes require integrated activation and demonstrated reciprocal innervation of muscles (Sherrington's Law). 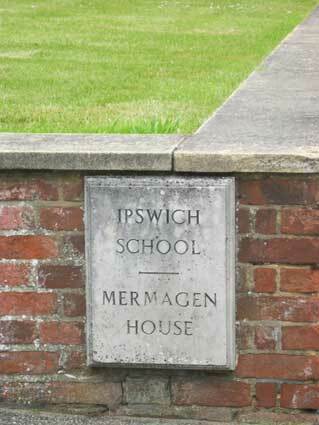 Sherrington entered Ipswich School in 1871. Thomas Ashe, a famous English poet working at the school, served as an inspiration to Sherrington. See our Street name derivations for a note on Sherrington Road. Patrick Hassell Frederick Mermagen (8 May 1911, Colyton, Devon – 20 December 1984 Ipswich, Suffolk) was a public school teacher and cricketer who played eight first-class matches for Somerset in 1930. He was headmaster of Ipswich School (1950–1972). Across the road is the Brett fountain and lodge house. See also our Curson Lodge page for further photographs of Ipswich School. This corner of Christchurch Park was in a sorry state for many years with the cabman's shelter which has been vandalised by fire wrapped up in tarpaulins nearby. Built in 1892, the cabman's shelter which once stood on Cornhill, was in 1895 pulled by a seamroller to a site north-east of the round pond, then ended up in 1995 burnt and neglected. In 2006 it was virtually rebuilt and re-erected close to the Westerfield Road entrance. In addition the 'green-roofed' Reg Driver Visitor Centre was been built in 2007 (it bears the Cobbold blue plaque) and the Bolton Lane park gateway with its stone pineapples and lodge house is a much more welcoming and attractive way into our principal town park. Apparently it was not possible to mount the plaque on either the Mansion or the Soane Street gateway, for conservation reasons. Felix was the son of John Cobbold, Member of Parliament for Ipswich, and his wife Lucy, daughter of Reverend Henry Patterson. John Cobbold, Thomas Cobbold and Nathaniel Cobbold (grandfather of Cameron Cobbold, 1st Baron Cobbold) were his elder brothers. He was educated at King's College, Cambridge, and later became a senior fellow of this college. Cobbold also sat as Member of Parliament for Stowmarket in Suffolk between 1885 and 1886, and for Ipswich between 1906 and his death. What else can be said about Felix Thornley Cobbold which hasn't already been said? Arguably the ultimate Ipswich philanthropist (possibly W.F. Paul is in the running) who has left his mark in many ways on the town: in 1892 he bought and presented to the town Christchurch Mansion (gently twisting the Borough's arm to save the surrounding parkland from housing developers). He donated to Ipswich the land for St. Clement's Baths (Fore Street Baths), a clock and carillon for St. Clement's Church and 45 acres of Gippeswyk Park plus cash for fencing. He even had a hand in the establishment of Rosehill Library on the east of the town (W.F. Paul was also a subscriber). Although coming from a staunchly Conservative family (his father and two brothers had been Conservative MPs), Felix showed his radical leanings by being elected Liberal MP for Stowmarket in 1885 and Ipswich in 1906. He had already been Mayor of Ipswich in 1897. The Cobbold Family History Trust (see Links) has funded a display of material inside the Centre about Felix Thornley Cobbold. Incidentally, the Centre was named after Reg Driver, the first Chairman of the Friends of Christchurch Park. 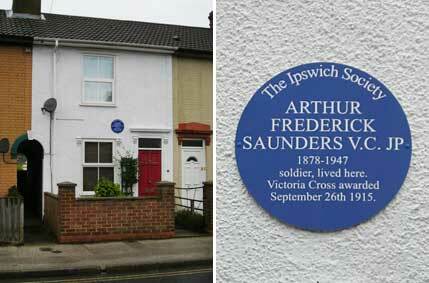 Arthur Saunders lived here at the time he was awarded the Victoria Cross, the first such decoration ever awarded to the Suffolk Regiment or a citizen of Ipswich. With this and the plaque for Leonard Squirrell (above) we see that the award of a Blue Plaque is not confined to the wealthy and the upper classes. 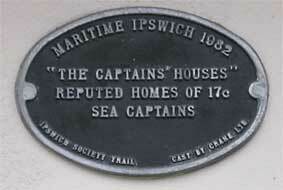 We are indebted to The Ipswich Society for the bedrock of the Blue Plaque information. The excellent work of this organisation in researching and recognising important as well as quirky buildings, streets and people in the story of Ipswich is invaluable; evidence of this can be found in the growing number of newly installed plaques for which they raise funds. 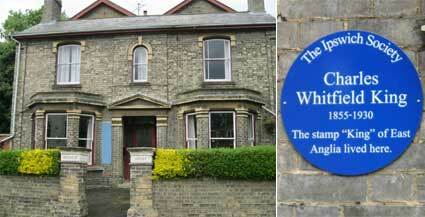 Go to their website (see Links), click on the Plaques link, see more images and download their leaflet on Blue Plaques. 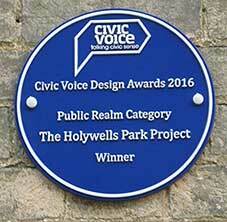 Note that a similar award and plaque, well-deserved, was given to Quay Place (St Mary-At-Quay Church) in 2017. 21 Tavern Street (plaque is low on the right side wall in Tower St). The Malyn family of Ipswich and London, vintners, took the name of Chaucer, derived from the trade of leather working, with which they were also associated. 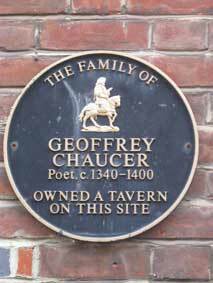 The Chaucer/Malyns including Geoffrey Chaucer's grandfather, owned and occupied premises on this site in the 13th and 14th centuries. Geoffrey Chaucer is commemorated by a full-length likeness, based on a 16th century portrait, in a stained glass gothic window in the Reading Room of the Carnegie Library in Northgate Street (known variously as Ipswich Library, Ipswich Central Library and Ipswich County Library). 47 St Nicholas Street. Thomas Wolsey, Cardinal of the Church, Archbishop of York and for 14 years Lord Chancellor of England for Henry VIII, was, next to King Henry himself the most powerful man in the realm. The plaque, mounted on Curson Lodge, a building of appropriate age, reminds us that Wolsey's boyhood home stood on a site on the opposite side of the street. 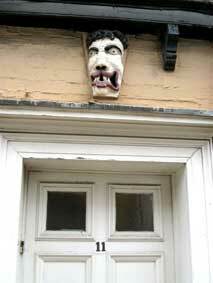 His birthplace is likey to have been in the parish of St Mary-At-Elms, perhaps on the site of the Black Horse Inn. This modern tablet set into the curved wall to the right of the famous gateway is showing signs of the erosion which besets the gate itself. 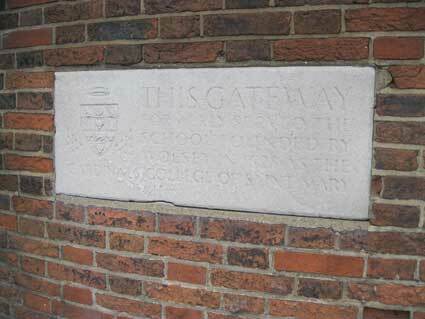 Much more on the Wolsey Gate on our Curson Lodge page. Like a section from Finnegans wake, this plaque on a large stone obelisk near the west door of St Clement Church, is remarkably free of punctuation. Starting with the lower case 'near' and trailing off with 'churchyard', the text is topped by an anchor symbol. The tiny Slade Street running between Star Lane and Salthouse Street was, in the 20th century, named after Sir Thomas Slade. According to N. A. M. Rodger in The Command of the Ocean: a naval history of Britain, 1649-1815: "The ships which [he] designed...were admirably suited to Britain's strategic requirements...By common consent, Slade was the greatest British naval architect of the century...it was generally agreed (even by themselves) that his successors, though competent designers, never matched his genius." Plaque in St Clements Church Lane. 13 Tower Street ("The Admiral's House"). 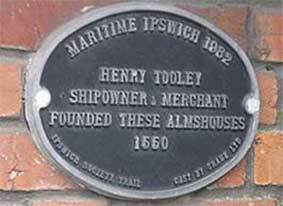 The plaque on this building commemorates the Ipswich-born admiral who lived here on his retirement after a distinguished naval career. He was made an honorary freeman of the borough in 1835. His portrait and paintings of six naval actions in which he took part, which he gave to the town, hang in the library room of the Town Hall. The house was probably built during the reign of Charles II (1660-85), with the later addition of a fine Georgian front. The interior is a mix of architectural styles. Once the residence of Admiral Benjamin Page and visited by the Duke of Wellington in 1820, it later became the home of eminent local architect, John Shewell Corder (see our Scarborow page). 44 Fore Street. Born in Holland, the artist settled in Ipswich after the Second World War, during which he was the official war artist to the Dutch government in exile. He lived for some years on a boat in Ipswich dock, finding inspiration particularly in dockside and river scenes, before making his studio and home in Fore Street in 1962. Ipswich Museum collections contain some of his works. The commemorative blue plaques which people recognise on London's buildings are installed and cared for by English Heritage. Although some may assume that such plaques found elsewhere in the country are also placed there by E.H., they are usually the work of the local civic society. This accounts for the wide variety of size, style and colour to be found in different towns and cities. 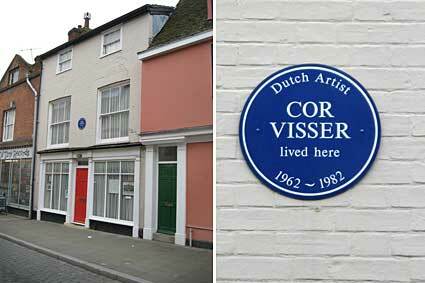 The Cor Visser memorial shown above was the first 'blue plaque' to be installed in Ipswich and it was designed (based on the English Heritage model) and funded by the late Brian Jepson, who lived at the house in Fore Street. As a friend of the Ipswich Society (see Links), it was not a great leap to use his design template and advice for the production of the present series of 'Ipswich Society' blue plaques illustrated on this page, which started to appear in 2001. Brian was Ipswich-born and joined Johns Slater Haward arcitectural practice as an office boy, training himself as an architect and finally working for the local authority. He was a man of many parts, not least an excellent painter of buildings and landscapes. He sadly died in 2014. Northgate Street. Pykenham's Gatehouse opposite the County Library was built in 1471 and is famous for its Tudor brick front and half-timbered rear elevation. It is almost all that remains of the former Archdeacon's Palace (other parts are probably buried inside the structure of the much-altered Ipswich & Suffolk Club). 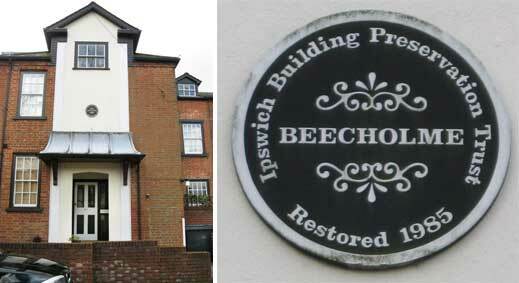 It was restored by the Ipswich Building Preservation Trust (see Links) in 1983, their first ever project. 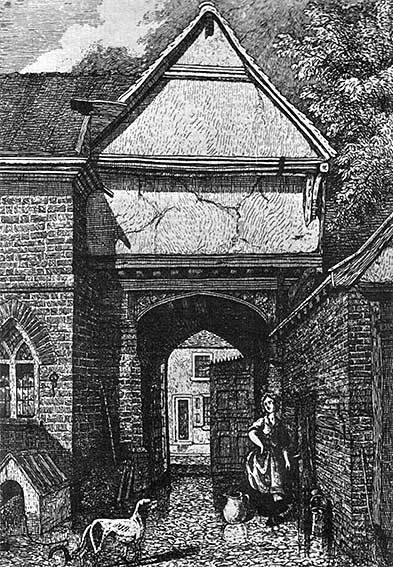 'The gateway situated in Northgate Street was the entrance to the residence of William Pykenham L.L.D., Archdeacon of Suffolk, Dean of the College of Stoke Clare and Chancellor of Norwich, 1471.' The engraving above is from Frederick Russel and Wat Hargreen's Picturesque Antiquities of Ipswich (published in Ipswich, 1845). The view illustrated is from today's Ipswich & Suffolk Club – windows have been opened up in the gatehouse in the later restoration by Ipswich Building Preservation Trust; the site of the future Public Library is visible through the gateway. The outbuilding to the right has been demolished and a door on the right of the arch now leads up to the upper levels. Bev Bowry and her husband have been 'researching Edward Bacon and his son George and their families [and] I have become very fond of these predominantly humble and philanthropic gents so if I feel the roles they played have been overlooked in any way I try and put this right... In view of the fact that you gave a talk a few months ago at the Ipswich and Suffolk Club about historic lettering in Ipswich, which my husband and I attended and thoroughly enjoyed, I thought you may be interested to know that whilst researching these Bacons we discovered that Edward Bacon bought the lease to the Archdeacon's House in 1859 from a John Cobbold (presumably John Wilkinson Cobbold). This was passed down to George and then to George's wife Harriet who sublet it to the Ipswich and Suffolk Club. We were totally staggered when we discovered that!' Members of the Bacon family appear on our Cornhill page under 'Lloyds Bank and Lloyds Avenue Arch'. Above: a comparison between the aforementioned Leonard Squirrell's 1941 painting of the Ipswich & Suffolk Club showing the bowling green and, right, the inevitable conversion into a car park and the loss of several Arts & Crafts features, all dressed in pink masonry paint. Another Ipswich Building Preservation Trust (see Links) renovation of a sizeable residential structure in a commanding position on the corner with Lacey Street. They don't always mark their projects (see Trinity Lodge) and this particular plaque is at the rear entrance to the building, off Lacey Street. See also The Wrestlers, The Globe Inn, The Half Moon & Star, Curson Lodge, the nearby house at 1 Arthurs Terrace, also 163 Woodbridge Road. 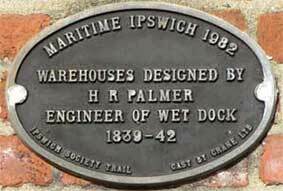 The Maritime Ipswich festival of 1982 marked the birth of The Ipswich Maritime Trust (see Links) and the beginning of a slow, gradual remodelling of the Wet Dock of heavy industry and maltings of the Industrial Revolution. This eventually culminated in the Waterfront Regeneration Scheme. 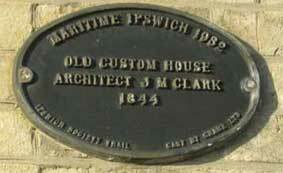 Ten plaques were cast by Crane Ltd. and erected on notable buildings by The Ipswich Society. All are still in situ. Site of Thomas Eldred's house, The Sailors Rest, Isaac Lord merchant's house, The Captain's Houses, The Custom House, Old Neptune Inn, Isaac's (malt kiln), Henry Tooley almshouses, The Old Bull Inn, Henry Palmer warehouses. 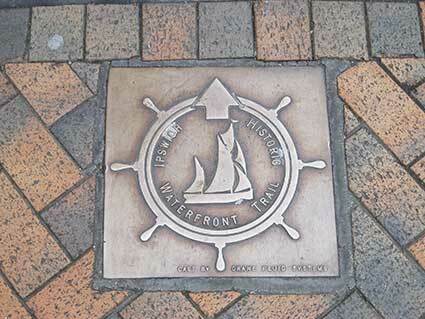 In 2017 The Ipswich Society (see Links) has fully revised and republished the 1982 Ipswich Maritime Trail booklet which now encompasses and identifies all ten oval plaques (shown above) in a series of linked walks around the historic Wet Dock and surrounding area. 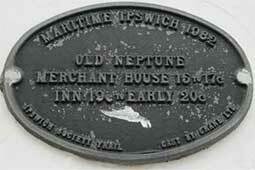 Copies of the new Ipswich Maritime Trail are available at the Ipswich Tourist Information Centre at £2.00 each. TO THE COPORATION IN 1665 BY CHARLES II. St Margaret's Green isn't very green. St Margaret's Plain isn't much of a plain. However, the street of that name is certainly a street. These areas put together were known from the times of King Cnut until the 19th century, as Thingstead, which is Danish for a meeting place. They stand just outside the northern ramparts and North Gate of the town. The above plaque stands in front of the former public house The Saracen's Head, a 16th to 17th century timber-framed structure, closed in 1960 to become a motor works with drive-in petrol pumps and in the 1970s and 80s a Comet electrical eqipment store; it is now a business centre. The area of St Margaret's Green was, from the time of Holy Trinity Priory, a very fashionable place which was overlooked in the 17th and 18th centuries by the houses of the gentry (including that bearing the Nathaniel Bacon blue plaque, see above). Indeed some of these large houses stand today. It was the meeting place of the parishioners of the old Wicklaw hundred and, as we read above, the site of an important fair. Several taverns served travellers and fair-goers including The Running Buck, The Packhorse as well as The Saracen's Head were all nearby. In the 1790s the Cobbold family lived on the Green, before the move in 1814 to their mansion in Holywells Park. In their employ was a servant called Margaret Catchpole who gained notoriety and almost mythical fame as Suffolk's leading (anti-)heroine, who skirted the law on many an occasion and stole and rode her master's horse to London, all in the cause of her lawless lover. The sailing barge and ship's wheel cast in bronze by Crane Co. include a directional arrow indicating the direction for walkers along the trail. This 'Historic Waterfront Trail' differs from the Ipswich Maritime Trail of 1982 (completely revised and republished by The Ipswich Society in 2017). 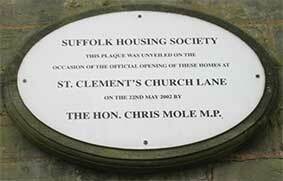 There are a number of these attractive, pavement-level plaques in the town. The above example is in Lower Brook Street. John Field, formerly Principal Planning Officer (Civic Design) and Town Centre Manager at the Borough, tells us that the Ipswich Borough Council leaflet to accompany the bronze plaques trail was published when the Church of St Stephen became the Tourist Information Centre in 1994. "These plaques were produced by Cranes for the Borough Council. Through my personal link with the Personnel Manager at the company, they produced the plaques free of charge and I had a couple of meetings with the apprentices who were used to produce the plaques as part of their training." Much of Arras in northern France was devastated in World War I but was rebuilt to the original architects’ designs including the distinctive gables which give the houses surrounding the Grand Place such character. The town was also the scene of fierce fighting during World War II. Ipswich and Arras were 'twinned' in 1993 (the fee for official twinning under the government scheme was apparently a disincentive) and the paved area outside the new Buttermarket Shopping Centre was named Arras Square to mark the relationship. 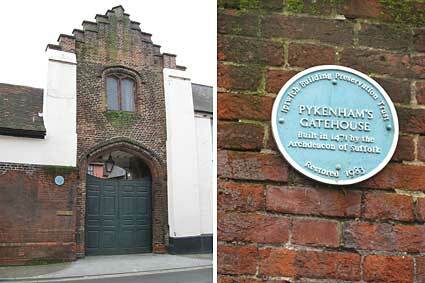 The two plaques shown above are attached to the south wall of The Ancient House, close to St Stephens Lane. 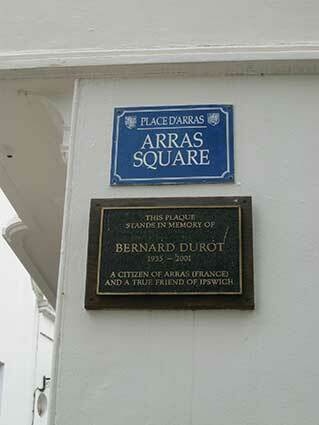 John Field, formerly Principal Planning Officer (Civic Design) and Town Centre Manager at the Borough and Chair of the Ipswich Arras Association***, tells us that: "Bernard Durot referred to on the plaque was the first President of the Arras Ipswich Association and the plaque was erected by the Council obviously after his death, and we arranged for his wife and daughter to be present at the unveiling with the Mayor and other people in attendance. 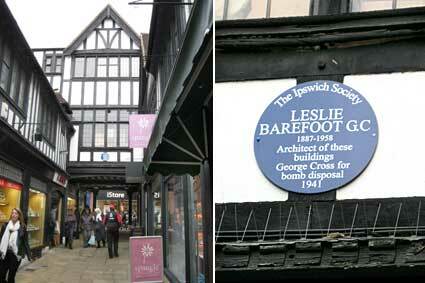 Bernard was an English teacher and Councillor in Arras; he was a great anglophile and, as stated, friend of Ipswich. As Chairman of the Ipswich Arras Association from the beginning it was a great pleasure to work closely with Bernard on a number of projects over the years." 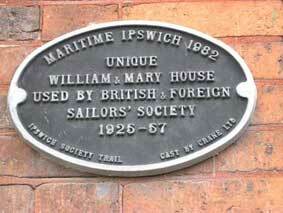 See our page about the Ipswich coat of arms for an equivalent street nameplate for Place d'Ipswich in Arras. 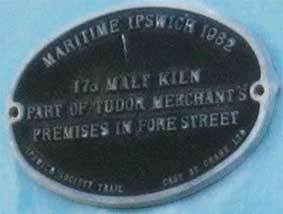 This little-seen plaque is fixed onto one of the main piers of the bridge on the Freston Strand side. Our thanks to Tony Marsden for recording it – we'd been told about it on a river trip on the Sailing Barge Victor, but never got round to visiting the site. The bridge carries the A14 (formerly the A45) trunk road from Felixstowe Docks to the A1, the M1 and the midlands. Since the mushrooming of these docks the bridge carries many times the volume of, in particular, heavy traffic than that at its opening. The main span of the Orwell Bridge is 190 metres which, at the time of its construction (1982), was the longest pre-stressed concrete span in use. The total length is 1,287 metres from the Wherstead side to Piper’s Vale. The width is 24 metres with an air draft of 43 metres. Pilings were sunk 40 metres into the river bottom. The main contractor was Stevin Construction B.V., a Dutch company. The main span was constructed by using a balanced cantilever technique, casting sections on alternating sides of the pier in a weekly cycle. The bridge is constructed of a pair of continuous concrete box girders with expansion joints that allow for expansion and contraction. The girders are hollow, allowing for easier inspection, as well as providing access for services, including telecom, power and a 711mm water main from the nearby Alton Water reservoir. The air draft of the central span was chosen to be as low as possible without adversely affecting port operations. 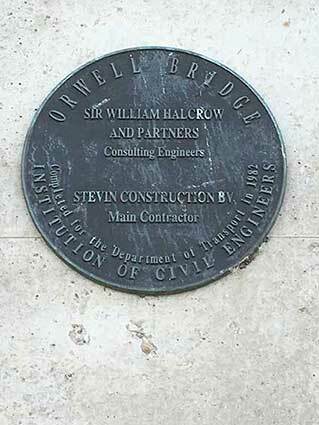 The consulting engineers were Sir William Halcrow and Partners. Frederick Gibberd Partners worked on the project to ensure the bridge was as sympathetic as possible to the Orwell estuary, with the final design winning the approval of the Royal Fine Art Commission. The bridge was set at an angle to the river to get the best relationship to the surrounding terrain. Many, including The Ipswich Society, opposed the building of the bridge in the late 1970s and early 1980s. However, its shape has become – that overused term – 'iconic' and is repeatedly used by local companies and organisations in logos and namestyles. The bridge lies roughly halfway between the old Bourne Bridge and the Monkey Lodge to Woolverstone Hall, Freston. See also our Willis monolith page for the obelisk which marks 800 years of Ipswich history. Hardly a plaque, as such, but it relates to this page.